Why did JW's stop worshiping Jesus in 1954? Was it 1954? Or 1984? I'm confustigated. 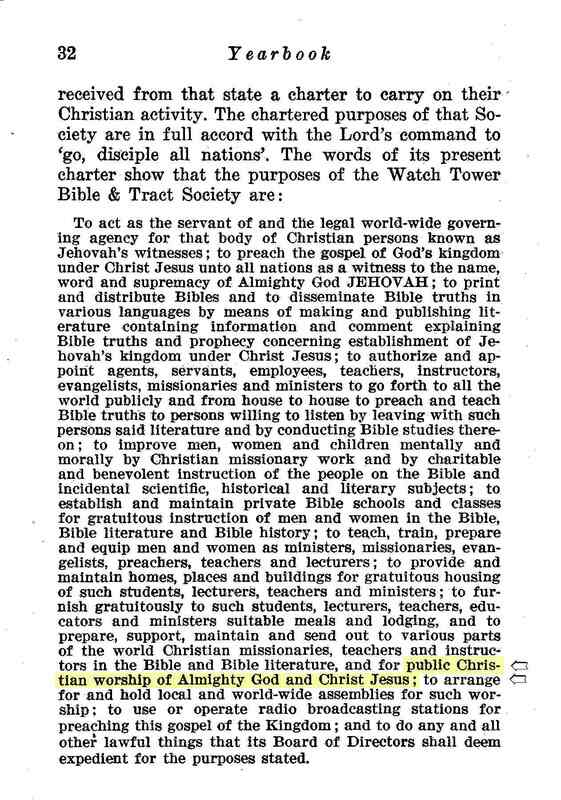 After at least 52 years of worshipping Jesus as God, the Watch Tower Society declared in 1954 that JWs should no longer worship Jesus. Yet the Society's Charter was not changed until 1999, removing the bit about the purpose of the Society being the worship of Jehovah AND Jesus Christ. They left it just as for the worship of Jehovah. "Since Jehovah God now reigns as King by means of his capital organization Zion, then whosoever would worship Him must also worship and bow down to Jehovah's Chief One in that capital organization, namely, Jesus Christ, his Co-regent on the throne of The Theocracy." "Should we worship Jesus? ...Consequently, since the Scriptures teach that Jesus Christ is not a trinitarian co-person [sic] with God the Father, but is a distinct person [which the Trinity agrees with!] the Son of God, the answer to the above question must be that no distinct worship is to be rendered to Jesus Christ now glorified in heaven. Our worship is to go to Jehovah God." Yet it wasn't til 1999 that the Charter was changed, to confine worship to Jehovah alone, according to the link you give! You ask why the JWs stopped worshipping Jesus. The simple answer is that their leaders claimed to have had 'increased light' on the matter, so when they told all JWs to no longer worship Jesus, they all did as they were told, no questions asked. I advise you not to search things of Jws in websites taht are not trustworthy be very careful. You should search for the real facts on www.jw.org the reall Jehovah's Witnesses website. We have never called ourselves Jesus' witnesses have we? I believe that contradicts whatever else you have been told. We obtained a more accurate understanding of the Bible's teachings. What is RECATNGLE OCTOPUS doing here? Is the devil in the belfry, right now?